I haven't been writing on the blog for long. Though I couldn't think of a reason strong enough to mention for this but maybe I have been a bit too occupied with college, newspaper writings and to top all reasons 'friends' (read:friend!). In last few months I earned some new friends (read this as friends!) and discovered some new ideas to explore in the times to come. I even drove straight to 'Neemrana' in Rajasthan for a day long trip with friends recently. Last week, I was done with my college internals and now plan to get back to writing and as usual reading books which I've piled for days and kept in a strange order of sequence on my bookshelves. For days I've been thinking to write, write and write here...but sometimes the brain can just not 'zero in' on a subject. A subject, so different, so challenging and yet so simple, yet so common. This is just that time which people term as '..one of those days' when mind is in constant warfare within; with thoughts contradicting thoughts and much more happening inside me. What I could however come down to and know well enough was that I've a strange habit of writing during 'nights' or rather 'in dark'. After days of procrastination from a friend, I had to bow and get on to writing yet again. Not to satisfy the said friend's wish alone, but for myself; for me to get better each day with writing skills. It was 19th last Monday, and I completed 19 years in exile, quite strange but even I'm 19 years old. 19th January 1990. Kashmir was breathing still; Kashmiri Pandits lay hidden like frightened pigeons in their own nest. Today on behalf of my fellow brothers and sisters, I wish to revisit the pain of my separation from my own home 19 years ago, when the cruel hands of Allah-Wallahs butchered members of my community for being idol worshipers, for rejecting the call for unholy Jihad and for siding with their own nation India. The Islamic murderers played dire warnings from their Mosques which pierced each nerve of anybody who held a Hindu name. As the sun turned pale, exhortations became louder, and three taped slogans repeatedly played their terror: 'Kashmir mei agar rehna hai, Allah-O-Akbar kehna hai' (If you want to stay in Kashmir, you have to say Allah is great); 'Yahan kya chalega, Nizam-e-Mustafa' (What do we want here? Rule of Shariah); 'Asi gachchi Pakistan, Batao roas te Batanev san' (We want Pakistan along with Hindu women but without their men). The roots of this unparalleled tragedy are immersed in 1986 with a well-planned strategy to execute Hindus from the valley. By 1990, the population saw their age old temples turned to ruins and lives at risk. As Pakistan stepped up their campaign against India, new Islamic terror outfits suddenly mushroomed in the state. As Jamait-e-Islami financed all madarsas to poison them against the minority Hindus and India, Pakistan further dictated youth to launch Jihad against India. A terror strike so meticulously planned that its unprecedented display was terrifying. As camps in Pakistan Occupied Kashmir (POK) began to provide training to innumerable Muslim men, India witnessed the emergence of the bloodiest Kalashnikov culture in the valley. The victims- innocent and non-violent minority- the Kashmiri Pandits. The Chief Minister Farooq Abdullah, abandoned his responsibilities and the administration, the state and people lay like cattle on an open road. The hidden fact of rigged elections in 1987 had by then become a lucid statement. Today 22 years later, Omar Abdullah takes position of the same majestic throne, though I wonder how efficiently he would carry forward the state of affairs. Will he like his father ruin the backbone of the state and leave the minority Hindus helpless as always, or will he rise above politics, religion to create space for Pandits in their valley? The unanswered question lingers on. He further wrote, “As I was about to leave, Satish’s uncle who was a bit vociferous and assertive, insisted that I should go upstairs and see the family deity. I agreed. A calm majestic figure was soon visible. It looked so imposing even in the darkness… With tears in their eyes, the family members thanked me and the accompanying officers. We were all moved over the sad plight of the family”. However one excerpt that mirrored my anxiety of 19 years was composed in words by Jagmohan, “Looking at the compact and enmeshed houses, and the by-lanes which acted like fine threads of a well-knit fabric, I wondered how these families, who had all their Gods and Goddesses here, and had deep roots in the soil, could leave and settle in distant and unfamiliar lands. Sometimes life is unaccountably cruel. And we human beings have, perhaps, no option but to suffer – suffer in silence, or wail”. ..Thus took place a 20th century Exodus. Pandits left the valley, with an approximate statistics of more than three lakh and fifty thousand. Almost a thousand Pandit men, women and children were slaughtered to death in 1990 alone by these revolutionaries of Islam. Surprisingly on paper, official figures clogged at only 209 killed! Alas! Soon the J&K government shall disown the whole Pandit community as aborigines of Kashmir. In this 19th year, a few hundred frightened Pandits still live scattered across the valley in far flung areas hoping against hope for peace and their brethren to step on the snow once again. This 19th year embarks upon a history of bullets to makeshift camps in Jammu with torturous summer heat to snake and scorpion bites and finally dreadful diseases. 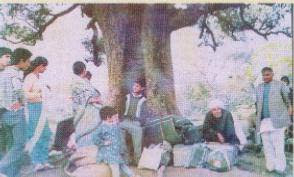 Seven camps in Jammu are an uninhabitable asylum for around 50,000 Kashmiri Pandits. The only perceptible change is an upgradation of some to permanent structures. My heart bleeds when I watch communal turned pseudo-secular Kashmiri separatists grab the headlines while the plight of the Pandits remains a non-issue. It isn’t the so-called Azaadi that the people of Kashmir desire. They long for an immediate crackdown on terrorists, an end to the separatist elements and those unbearable puppets in the Valley- all for normalcy to return. Though sidelined for now, the political patronage they enjoy could soon take the voices from the Hurriyat and JKLF spreading propaganda of terror and hatred to the frontlines of politics. An entire community uprooted from the land of their ancestors is today struggling for its identity. The weak-kneed Indian state shamelessly panders to Islamic terrorists and separatists who claim they are the final arbiters of Jammu and Kashmir's destiny. A part of India's cultural heritage is destroyed; a chapter of India's civilization has been erased. And, our jhola-wallah brigade of ‘secular’ activists unabashedly turns their back to the plight of Kashmiri Pandits. To them I believe, ‘Hindu sorrow, inflicted by Islamic terror’ is a truth perhaps too harsh to accept. Thereby hangs a tragic tale that is completely wiped out from public memory. I’m as old as the terrorism in the Valley. In these 19 years, the only time I felt the breeze of my land was through the closed windows of my airplane. She beckons me and I am too desperate now to grab its serene quilt. My mother nature has summoned me, and I shall answer her call soon, very soon. Till then, in this 19th year of exile like the unanswered questions of our human rights …my struggle for existence also continues. long back it was morning of january,90 when i entered jammu bus stand and cudnt guess why so many of kashmiri pandits hav jumbled up there, some sitting, few strolling in vain and many holding little crying kids.Being a dogra child, it was always some excitement and unusual to find a kashmiri pandit in jammu those days especially in pherons and i always wondered how they were so fair and red cheeked. little, i knew then that soon the pheron shall disappear from the wardrobes of pandits and there wont be the same curiosity to find them in jammu. it was years later that i realized the reason behind that rush on jammu bus stand, it was migration as the word went around and forceful exodus as any sane idian shall put it. Truth is truth.... Keep Writing.